Over the past couple of months, I have been fairly preoccupied with work and it was difficult for me take any reasonable amount of time to fully engage with the trip, so Andrew took the reins and decided that we would book accommodation through AirBnB and travel to Madrid on the coach. It is worth pointing out, at this stage, that I am possibly not the greatest lover of Pride celebrations. Last year was an exception as I happened to be holding the banner at the front of the Stonewall processions through the streets of London, and the atmosphere of being part of the procession, passing through crowds of very supportive people was pretty special. However, on previous occasions, as a mere onlooker, I have found myself to be at odds with the LGBT elements of Pride. I am not going to go into any detail, but I find the crowds in Soho, and the general propensity for drinking too much to be a younger person’s game and it no longer holds much attraction for me these days. The fact that I had a cork thrown at my head on one occasion did little to boost my enthusiasm! 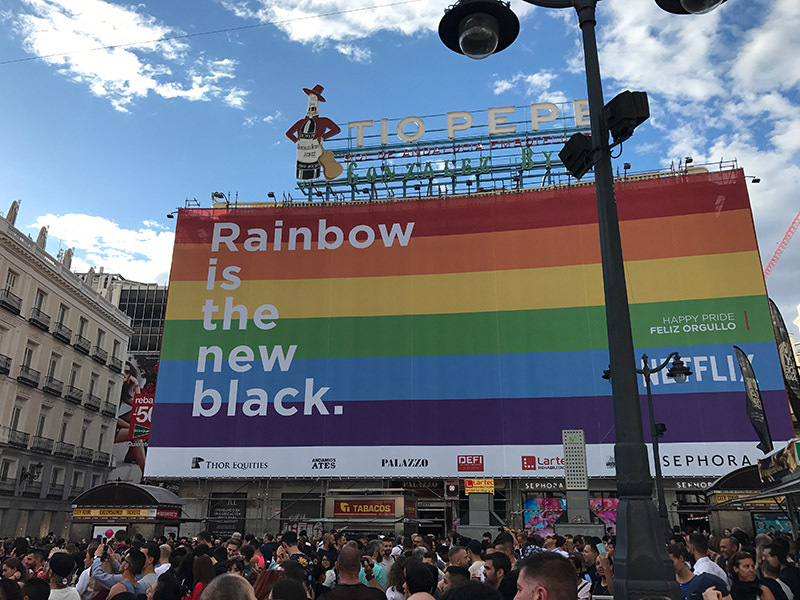 Some criticism was levelled at the organisers of Madrid World Pride this year, that their marketing was far from being inclusive in its representation of a group of young, well-toned white men having a ball, and this is a shame, as the event that we witnessed in Madrid was completely and utterly inclusive. The only ‘exclusive’ element was evident in the Chueca area of the city - the more LGBT focused corner - where the crowds assembled in much the same way as they do in Soho. Anyway, I digress slightly. Our trip was as much about seeing Madrid and it was just an added bonus that World Pride took place at the same time. Catching the bus meant we were able to travel from our village to Madrid practically door-to-door, and at a very reasonable price. I was surprised by how pleasant the journey was, and how punctual. It was a joy to be driven so I had time to take in the scenery, or have a snooze. There are vast areas of the countryside to the south of Madrid that are unspectacular, so that was the time to watch a film, or snooze some more. Andrew had arranged AirBnB in the Atocha area of the city, not far from the bus station where we disembarked, and the accommodation was more than adequate. Mercedes was our host - an interior designer who was bursting with character. Her boyfriend, Juan Carlos, was equally ebullient and the pair of them could not have been more welcoming. Our bedroom was on the small side, and there was another guest who shared the bathroom, but this did little to dampen our enthusiasm. Madrid was a city in the middle of a huge party. Everywhere you went, there were signs of celebration - flags, banners, special exhibitions, concert stages, you name it. However, what was most marked was the attitude of everyone we met who were, unequivocally, as welcoming as we were excited. There were no signs at all of inequality or discrimination. In fact, it seemed slightly unnecessary to be reminded that Pride was about celebrating freedom to love who we want, as this was a city that seemed, already, to understand that premise wholeheartedly. This is clearly not the case in too many places across the globe, but Madrid, and Spain as a whole, is one of the most non-judgmental countries I have every experienced. Here, family is the most fundamental aspect of life, and very little else matters. I love this aspect of Spain; I love the people, the attitudes, the acceptance and the welcome. That first evening in Madrid, we wandered the streets with little idea of our bearings, following people out to enjoy the atmosphere of a city celebrating love, the summer, culture, diversity and the beauty of its own history and architecture. We ended up in a square (Puerta del Sol) in which was situated one of the sound stages, and stood watching some fine examples of Europop at its best, as the sun took its leave and we downed a Mojito surrounded by young and old, families with children, couples, groups of friends - in fact, this crowd was representative of diversity in all its glory, and it could not have been more friendly and fun. Our first tipple was taken at La Fragua de Vulcano in Calle Alvarez Gato 9. It was the nearest place to where we happened to be located when we became thirsty and hungry, and the reviews in trusty TripAdvisor made it worth a look. It didn’t disappoint, and we had a refreshing tincture accompanied by some rather delicious mini empanadas. As with so many Spanish bars, once in it is sometimes hard to leave. It was more than just a brown paper bag, honest! We wandered about a fair bit, stopping for a Mojito in Puerta del Sol, and watching some of the live performances on the sound stage, before moving on to another Trip Advisor recommendation, La Tita Rivera, on Calle Pérez Galdós. This was not overly crowded, but bustled with atmosphere and the small tapas-sized plates were very tasty. There is a courtyard area, but this was packed, so we managed to find a table near the bar and kitchen from where we could watch the tempting platters being prepared. This was a fun place and a great spot for our first evening in Madrid.